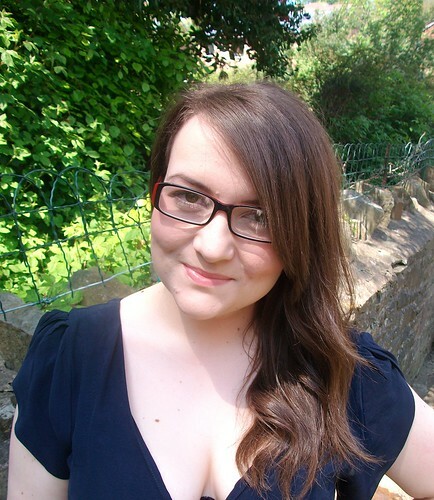 Fat Frocks: Glasses: To embrace or avoid? I like the idea put forward in Vogue, that you can have fun matching your make-up to your glasses; I mean, I'll take any excuse to buy some new beauty goodies, but I'll need a bit more persuading that four eyes are better than two before I rush out and spend a fortune on designer frames. So I looked out for some glasses-wearing celebs to lead me along this somewhat untraveled road. First to crop up was the stunning Myleene Klass, who, I have to admit, does pull off her black frames with style. Abigail Spencer's ultra-geek glasses are another story. With such a pretty, petite face, why hide behind something of such excessive proportions?! 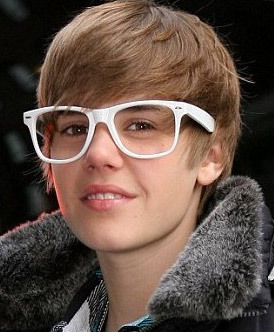 Looking at pictures of her, along with some ridiculous ones of JustinBieber in huge white frames - purely for comedy value - it's clear you have to be careful to match your look with your frames, or they could completely over power you. I never wear my glasses in public, I've always felt a little uncomfortable in them. Do you prefer to be bold with your choice of frames or go without? ....I think we have the same frames in different colours, haha. I embrace my glasses when I need them. Otherwise, I'd be stuck cause there's no way in hell I'm letting anyone laser my eyes. I'm also a glasses wearer but only at home :). Mainly because I work out in the mornings and like to wear contacts then. You look great in yours and should give them a try! Embrace! I think you look cute. I only wear glasses for reading, but they are big obnoxious thick rimmed things. I like them. I associate them with reading and enjoy getting them out and putting them on, it's all part of the ritual of sitting down to read seriously (I can see well enough to read without them, I just get headaches if I do it for a long time). Embrace the frames girl seriously! I'm as glasses wearer and don't really care what people think about them - I don't understand why people don't like wearing them to be honest. Yours really suit you! I think they look lovely! If you need them, wear them I say! I think you look lovely in your glasses, they really suit you! I don't wear mine because luckily I have a weak prescription but I just can't get used to them!